The majority of the grassroots football community want to see "penalty goals" used as a punishment for deliberate goal-line handballs, despite FIFA president Sepp Blatter ruling out such a rule change. A poll of over 5,700 Club Website members found 61 percent in favour of a new rule, joining widespread calls from the football world in the wake of Uruguayan Luis Suarez's deliberate handball that denied Ghana a historic place in the World Cup semi-finals. Suarez was given a straight red card for the incident in the dying seconds of extra time but, when the resulting penalty was missed and Ghana went on to lose the shootout to Uruguay, the striker claimed he had "made the save of the tournament". With the match officials doing all they could within the Laws of the Game, calls for a stronger punishment began almost immediately, with ex-FIFA referee Graham Poll at the front of the queue. “The officials got it spot on, dismissing Suarez and awarding a penalty, but that gave Uruguay a lifeline they did not deserve," said Poll. Despite the groundswell of support for a stronger punishment, FIFA president Blatter has ruled out such a rule change at October's meeting of the International FA Board (IFAB), the body that determines the Laws of the Game. "You have seen in this [World Cup] competition and in others that it's so difficult to say if a ball is in or out," said Blatter. "But if it is not in, then no referee can declare it is a goal. This is definite." So it appears that any outfield players out there who fancy a spot of last-resort goalkeeping to save their team will, for the time being at least, run the risk of no more than a penalty and a one match ban. But for those 61 percent of you out there disappointed with Blatter's stance: don't despair. Whilst unusual, FIFA U-turns are not unheard of. After all, it was only back in March that Blatter ruled out any form of technology being introduced to the game. Now, just four months and one embarrassing Frank Lampard "goal" later, FIFA have been forced to re-consider their stance. Blatter admits that "it would be a nonsense not to reopen the file of technology" when IFAB reconvene and so goal-line technology is back on the table. One wonder how many more "saves of the tournament" from outfield players it will take before the same can be said for penalty goals. 61 percent of Club Website members live in hope. So who are backing: Club Website members or FIFA? 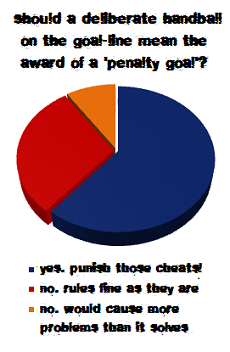 Do you agree with the majority in favour of penalty goals or are you with Sepp on this one? Whatever you think, let us know in our comments section below. Should a deliberate handball on the goal-line mean the award of a 'penalty goal'?